Traditional blue for boys and pink for girls is given a thoroughly modern twist with divine new nursery bedding collections by Habitat Baby. The baby blue Geo collection features retro geometric patterns with splashes of deep blue and lime for contrast. For girls, geometry goes floral with the Garden Party collection, where hints of aqua and lime temper the pink. Habitat Baby offer complete cot sets for a perfectly co-ordinated look. Each set includes a reversible quilt, a fitted sheet, a flat sheet, an Oxford style junior pillow and a throw cushion. The emphasis is on ‘perfectly co-ordinated’ and I don’t mean ‘matchy’. Rather, Habitat Baby’s different patterns work beautifully together, allowing you to highlight different shades of pink or blue and choose the intensity of your pattern. 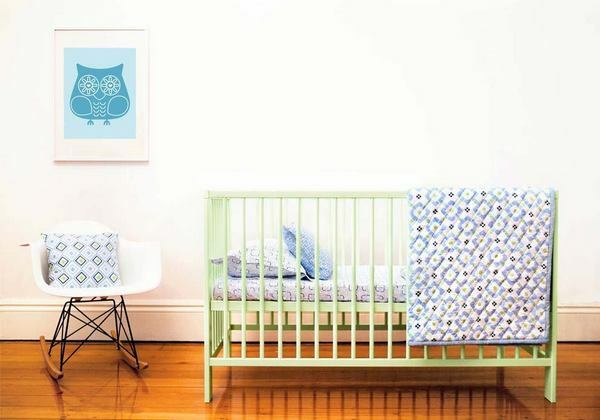 Cot sets are $239.95 each and are available from Urban Baby. Also available are additional cot sheet sets for $84.95 or single cot fitted sheets for $39.95.